Since the foundation in 1959 of the Ministry of Culture, cultural policy in France has enjoyed a profile unparalleled in any other country. 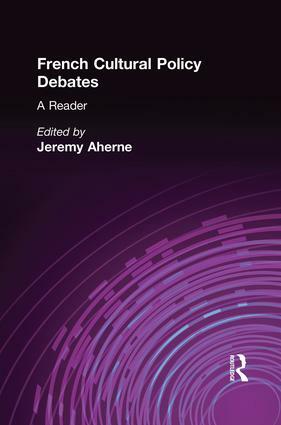 French Cultural Policy Debates: A Reader makes available the key contributions to a debate which has not only focused on the precise modes of political intervention in cultural production, but has also provided a forum for the discussion of much wider social and political issues. Acknowledgements. Preface. Introduction Jeremy Ahearne. PART ONE: The 'invention' and early critiques of cultural policy 1. Theatre: A Public Service Jean Vilar 2. Leisure and Culture Joffre Dumazedier and A. Ripert 3. Speech Given on the Occasion of the Inauguration of the House of Culture at Amiens Andre Malraux 4. Inequality at School as the Key to Cultural Inequality Pierre Bourdieu 5. The Villeurbane Declaration PART TWO: Cultural development 6. Chalon: Four Years of Cultural Action Francis Jeanson 7. The Age of Culture Jacques Duhamel 8. Cultural Action: Integration and/or Subversion Pierre Gaudibert 9. Cultural Industries Augustin Girard PART THREE: National creation and the economy 10. Culture and the Economy Jack Lang 11. The Cultural Imperative Marc Guillaume 12. A Cultural Elan Jacques Renard 13. Cultural Democratization: The End of a Myth Olivier Donnat 14. The Cultural State Marc Fumaroli 15. The Power of Creation or Power to the Creators? Jean Caune PART FOUR: The routinization of charisma 16. The Cultural Industries Jacques Rigaud 17. Missions for the Ministry of Culture Philippe Urfalino 18. Cultural Febrility Pierre Sansot 19. Chapter of Public Service Missions for the Performing Arts Catherine Trautmann 20. Cultural Diversity and the Cultural Exception Catherine Trautmann Bibliography. Index.